The cannabis industry has created some truly fascinating cannabis related products over the last 8 years—from blunts to vape pens to concentrates to dabbing to THC and CBD strips, and everything in between. It seems like every other day, someone gives us another way to consume cannabinoids. Case in point: THC distillates. How are THC distillates made? How can you use THC distillates for yourself? The experts at Honest Marijuana will answer those questions and tell you everything you need to know about this newest cannabis craze. A distillate is the end product of a process called—wait for it—distillation (duh, right?). Distillation involves separating the chemical components from a liquid mixture by controlled boiling and condensation. If you’re at all familiar with moonshine, The Dukes Of Hazzard, or the hills of Kentucky, you’ve probably heard the words distiller, distillery, or even still. That’s because humans have been using the distillation process to refine their alcohol for decades, if not centuries. So it’s really nothing new. What is new, though, is applying distillation to cannabis plants and cannabis concentrates in order to extract the purest cannabinoids possible. Once we’re through those, it will be easier to explain how THC distillates are made. And if those subjects seem a bit daunting, don’t worry. We’ll keep it as simple as possible. The best-known cannabinoid is THC, but there are 113 in all (including CBD, CBG, CBN, and CBC), and more are being isolated every day. Cannabinoids are chemicals that interact with the endocannabinoid system in your body and brain to get you high, decrease your anxiety, and relieve your pain. Terpenes are oils that give the pot plant its unique flavor, smell, and medicinal properties. Flavonoids are molecules within the plant itself that combine with the terpenes to produce distinctive tastes and aromas like that given off by the famous Sour Diesel strain. Terpenes and flavonoids can make your ganja taste fruity, earthy, or even zesty. The thing about cannabinoids, terpenes, and flavonoids is that they all have different boiling points. “Why is that relevant?” you ask. Because separating these chemicals from the marijuana plant without completely destroying them is the ultimate goal of producing a THC distillate. For that, we first have to learn about cannabis concentrates. Concentrates, a.k.a. 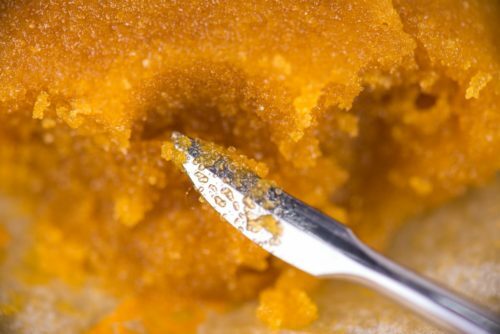 extracts, are all the rage right now, and for good reason. They are exactly what their name implies: concentrated versions of the cannabinoids found in store-bought bud. So if your favorite Fruity Pebbles strain measures in at 12 percent THC, the concentrate taken from that same strain could double or triple the potency if processed correctly. 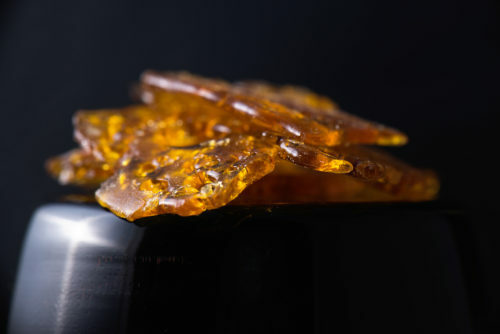 Concentrates are made through a process called solvent extraction. Cannabis plant matter is soaked in chemicals such as isopropyl alcohol, chloroform, carbon dioxide, propane, butane, or even ice water. The solvent strips the plant of its cannabinoids, terpenes, and flavonoids and holds them in a liquid state. 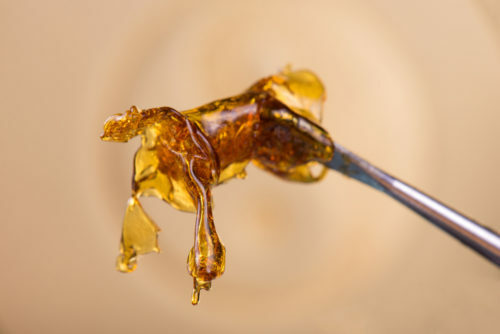 The solvent is then forced to evaporate (through a change in pressure or temperature or both), leaving behind a gooey liquid (like honey) that contains nothing but canna-goodness. The final product is then allowed to harden into shatter or wax for use as fuel for all your dabbing fantasies. Sounds like the holy grail of cannabis consumption, right? The most perfect form of cannabis that money can buy? Well, sorry to burst your bubble, but it’s not even close. THC distillates claim that top spot. Here’s why. As already mentioned, concentrates are usually produced by raising the pressure and/or temperature at some point during the extraction process. The focus of the solvent extraction is usually the cannabinoids THC or CBD. The problem with focusing on just the cannabinoids is that the other beneficial chemicals in the marijuana plant—terpenes and flavonoids—have very different boiling points. So in the process of extracting the cannabinoids, the terpenes and flavonoids are usually destroyed. This dramatically affects the purity and potency of the final concentrate. Combine a solvent and cannabis plant matter to extract the cannabinoids, terpenes, and flavonoids. Raise the temperature of this solution to boil off the terpenes and flavonoids (they have a lower boiling point than the cannabinoids). Allow the steam from this boiling to pass through a water-cooled tube that causes the gas to turn back into a liquid. Those are the terpenes and the flavonoids. Raise the temperature of the solution even more to boil off the cannabinoids. Allow the steam from this boiling to pass through a water-cooled tube that causes the gas to turn back into a liquid. Those are the cannabinoids. You now mix the terpenes, flavonoids, and cannabinoids together, let it solidify, and you’ve got your THC distillate. There’s alot scientific information that goes into it, but that’s the basic technique. Having trouble visualizing the whole thing? Thanks to Wikipedia, you don’t have to use your imagination. 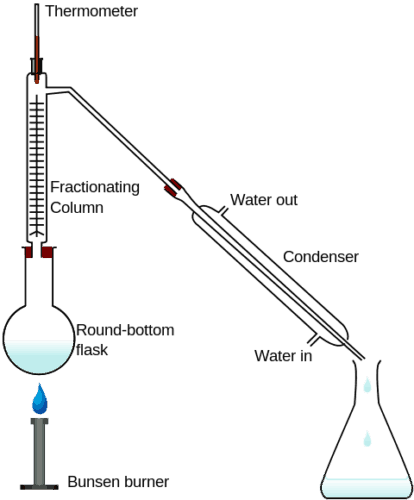 Here’s a simple illustration of the distillation process (the action goes from lower left to lower right). When all is said and done, you’re left with an amber liquid about the consistency of thick honey. You allow the distillate to harden (or keep it as an oil), and you’re good to go. Again, there’s a lot of technical knowledge that goes into creating a distillate, so we don’t recommend trying it at home no matter how simple we’ve made it sound. Stills can explode if not operated correctly, and we’d hate for you to get injured trying to make something you can (or soon will be able to) buy at your local dispensary. Distillates are already decarboxylated, so the chemicals can interact with your endocannabinoid system right away. Distillates are almost 100 percent pure, so you don’t have to worry about additives or left-over chemicals. Distillates have a very high THC content, so you don’t need much to feel the effects. Distillates are discreet (unlike burning down on a dabbing rig in the middle of the break room). And these are just the tip of the iceberg. The advantages run the gamut from storage to transport to cost per gram. Distillates really are the next phase in the evolution of cannabis consumption. But that raises the question, “How do you use THC distillates?” Read on to find out. Administer a drop of liquid THC distillate under your tongue as a tincture. Add a THC distillate to the tank of your favorite vape pen. Scoop a bit of hardened distillate onto the nail of your dab rig. Spread a small amount of THC distillate on a rolling paper, and then create your own joint or blunt. Swallow a drop of THC distillate (like a pill) for all-night relief from your symptoms. Mix a THC distillate into your cannabutter and other edibles. There really is no end to the ways you can use THC distillates. The only limit is your imagination. So give THC distillates a try to find out for yourself if they’re right for you. YourCannaLife is seeking out individuals & businesses with at least $100,000 in liquid capital to invest in cannabis related business ventures that are located in legal states and countries. We have a following of 24,000 followers and over 18,000 business likes on Facebook. We have access to dozens of businesses that have been vetted by us and have the required qualities to be worthy of your investment. There will be a finder’s fee for introducing us to investors that are seeking to invest in any type of business venture. If you would like to interact with us on social media “Like” our Facebook Business Page. Share and leave your comments down below.